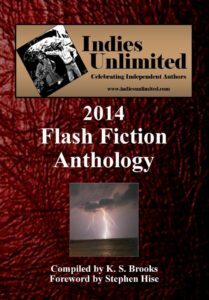 The Indies Unlimited 2014 Flash Fiction Anthology features a year’s worth of winning entries from the IndiesUnlimited.com weekly flash fiction challenge. It contains 50 stories by 34 different authors from around the world, with pictures by award-winning photographer K. S. Brooks and thought-provoking prompts by five-star author Stephen Hise. From a magic marmot to a zombie trick-or-treater, there are a myriad of genres and stories to appeal to every taste. I love prompts they are great fun for all writers and help stretch your creativity as you can tell in this anthology of short shorts.